Alaina Viau works at the Glenn Gould School at the RCM as the Opera and Royal Conservatory Orchestra Manager. What makes her tick? Real performances where there is natural movement and real emotions on stage, with singing that will make you cry with tears of comic laughter and tragic sadness. Opera should make you feel more alive and human and light a spark in your soul. That is what great opera is. And so we come to the first production launching another new opera company in Toronto. Viau is the Artistic Director of LooseTEA Music Theatre, setting sail in September with their production of La Tragédie de Carmen, based on Peter Brook’s adaptation of Bizet’s opera. The opera will be performed in French with English surtitles and with dialogue in English. On the occasion of the production & the first night of LooseTEA Music Theatre I ask Viau ten questions: five about herself and five about her multiple roles in creating La Tragédie de Carmen and LTMT. Luckily, I think I am an even split between both. They are both very hard workers, who think creatively (my mum in the artistic sense and my dad in the business sense) and with an attitude of “if you don’t know how, figure it out!”. Neither mum nor dad believed in TV for children so my brothers and I played in the backyard. We made up stories and sang (a lot)! My larger personality traits like drive, ambition and discipline are from my dad. I think the ability to take a large project and break it down to day by day tasks is also from my dad. He sees creativity as a process that is worked on every day. He is also very multifaceted; a PhD in chemistry, a very busy wedding officiant, stage manager, and more recently became a certified yoga teacher! I am a Director, Producer, stage manager and conductor who did all my training as a singer! Yes, I certainly got that from my dad. He also always encouraged my interest in physical activities. My mum is the right brain parent. She is creative and fostered creativity in me and my brothers. She is actually the costume designer for La tragédie. I could not think of anyone else I’d want to work with, because I know that her work will be impeccable. With her enthusiasm she inspires other people who become very loyal to her! I know I got my practicality from her, and I am still trying to learn her amazing people skills. 2) What is the best thing or worst thing about being Artistic Director of a new opera company such as Loose Tea Music Theatre? The best thing, and the reason I started this company, is to be able to do my own thing and to have creative control! I get to practice what that I have been wanting to do, with the freedom to do it how I want to. Since I was about 11 years old I always had the idea that I wanted to run a business. I remember picking up my dad’s business books, in particular “The Science of Getting Rich” and being completely enthralled. I was always telling everyone what to do and how to do it. My brothers can attest to that. I have always been a leader but I really love the collaborative process. I think of leading as taking my vision, presenting it to my team and see how, with their expertise and knowledge, it can be made better. I love that I get to work with incredibly talented and dedicated people. They inspire me to push further, to make something better. It is all about having a great team. On that note, one of the challenges is finding the right people for the vision; people who are excited by the project and will push with me to make it the best it can be. I’m also wearing several hats, especially with a new company where the infrastructure is still being sorted out. I am producing and directing the show but also having to lead the direction of the company as a whole. It is a lot of work, but I am enjoying the process and learning a lot!!! I have been on a huge Beethoven kick. My ear craves his symphonies and string quartets. Also, the Alpine Symphony by Strauss. I feel slightly bad for my colleagues at work because I listen to the latter very often. Luckily they like to hear it too. In one day we listened through 6 different versions, and note that the piece is about an hour in length – that was a lot of Strauss! I think we took a break and listened to Mozart’s 40th symphony to give our ears a rest! Bernstein; I listen to many of his recordings and watch his conducting videos. I love Joan Sutherland, Jonas Kauffmann and Tafelmusik. On the non classical side I love swing and funk in particular Big Bad Voodoo Daddy and The Soul Motivators who are local in Toronto. Old school jazz is also at the top of my listening like Ella Fitzgerald, Louis Armstrong, Cab Calloway etc… and who can resist a bit of Santana!! I wish that I had taken Ballet. While I was working at the Royal Opera House, I watched everything that The Royal Ballet performed! Sometimes, depending on the rep, I would look forward to it more than the opera. My favourite was Manon and I’m sure if I had still been there to see it, Mayerling would also be at the top of the list. Both of them are choreographed by Kenneth MacMillan. I also really loved what I saw of Liam Scarlett’s Sweet Violets based on Jack the Ripper. I am hoping that I will have enough time this year to take the adult ballet classes at the National Ballet School! I run and bike daily. I have a lot of energy to burn off at the end of the day! I am a very social person so I like to surround myself with awesome friends that know you well enough that you can just say anything! I would rather eat lunch at my desk at the RCM so I could take my break to have coffee with a friend! Sometimes it is hard to define where work ends because I love sitting down with a score and/or recording and going through a work new to me! I get very excited about music so it doesn’t necessarily feel like work. I also love LOVE to read, it feeds my imagination. I love to sit in a comfy chair, in a nice sunbeam with a cup of tea, possibly with a cat on my lap! That is bliss. Five more concerning Loose Tea Music Theatre’s production of La Tragédie de Carmen. 1) Please talk about the challenges in starting an opera company. There are many challenges mostly because it is possibly the worst business model out there! You have all the demands of theatre and orchestra put together! My challenge has been, as with any arts organization out there, finding the funding to make the show what you want it to be. Unfortunately for my first production, Loose Tea is not eligible for many government grants. I have found that I just don’t have enough time to really pursue and follow up with corporate sponsorship. Which leads to the next challenge; I have to wear many hats and be able to lead the team with clarity. That being said, I have a dream team crew and cast who have been able to be creative on aspects that I just can’t get to. I am also very lucky that I have strong support from my family. Building the entire infrastructure is also difficult. I had an idea about the way I was going to structure the company but along the way it has morphed into something else. It is great, and exciting that as you and your ideas grow, the company can be flexible enough to respond to the changes! That is the main reason for the “music theatre” in the name. I didn’t want to be restricted to only opera! 2) what do you love about La Tragédie de Carmen? What I really like about La Tragedie is that it takes the story back to the original setting of Prosper Mérimée’s novella. In this version, Don Jose kills many more people and only in 1.5 hrs! Now that is an action packed opera! Although Bizet’s Carmen is a fantastic opera, I get weary of the traditional setting and interpretation. La Tragedie retains all the famous arias but the ensemble pieces have been cut to pare down the cast. Zuniga and Lillas Pastia/Garcia are now acting roles that have no singing. This allows story to focus on the essential relationships. It has also made it easier to give it a new setting (1920s) because there is not as much text about Seville, gypsies and Spain. That being said however, this adaptation was not completely successful. We have swapped in parts from the original to fill these holes; the toreador song and the final scene. There were also musical and dramatic inconsistencies that we filled, sometimes with dialogue taken from the novella. At points more appropriate music was written to transition between scenes. We also found the accompaniment of the arias a bit sparse, so we opted to use Bizet’s piano reduction. If we remount the show with full orchestra I will have to write my own parts! I like the idea of creating a version that balances the authenticity of both Bizet’s work and Mérimée’s novella with musical and dramatic integrity. 3) Do you have a favourite moment? We just choreographed the fight scenes with fight director Sean Brown. I love our fight scenes!! There is actually quite a bit of violence in this adaptation and the cast has been exceptionally receptive to the choreo. I am so glad that we swapped in the original last scene. Musically it is brilliant, and dramatically it gives Carmen the chance to choose her death. In context with the rest of Don Jose’s actions, this scene is even more heightened than in the original. At our venue, Buddies in Bad Times Theatre, the audience will be very close and sometimes in the middle of the action. I think that it will be very effective. 4) How do you relate to this opera as a modern woman? This whole opera is centred around the sexuality, intelligence and individualism of Carmen in a time when women did not have rights or were thought of as persons. They were still considered property. The opera exposes how one woman defined her independent existence by maintaining her freedom though control of her sexuality. She is empowered through her sexuality not hindered by it. She is not a victim, she chooses her death rather than give her power away. It shows immense strength of character. I liken it to the samurai who were unafraid of death and thought that dying in battle and protecting their values was an honorable death. Carmen chooses her death and honours herself and her values. She is not Don Jose’s victim. Don Jose is really the victim. I feel that women today are dealing with these same issues. Many times we don’t honour ourselves because of society’s expectation to be a certain way. It takes a very self aware woman to be who she wants to be in a society where there are still glass ceilings and “womanly” expectations. Carmen’s character could be set in modern day and even into the far future and would still hold the same relevance. I have yet to find out who Mérimée modeled this character after, but do wish I could go back in time and meet her! 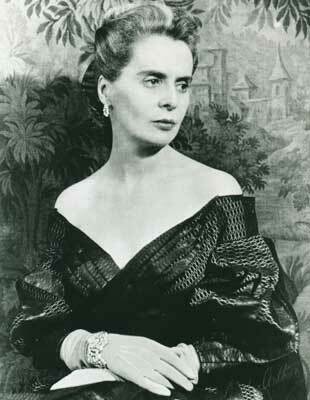 Ninette de Valois. She was the founder of The Royal Ballet. She started with a small group that danced on all the piers of England. She then developed it into the Saddler’s Wells Ballet and then eventually into The Royal Ballet and the Royal Ballet School. She started out small, doing what she loved and grew it into one of the world’s best ballet companies and school. She demanded perfection and had such drive and dedication to her craft. There was an exhibition at the ROH while I was there that I read over and over again. This is where I developed the idea of my own company. I felt inspired by her demand for perfection and to develop a solid education program in which to draw her dancers. It all came from this one woman with a vision. She worked tirelessly to have it be what she wanted it to be. I love that she was able to reach through history and inspire the seed in my brain. LooseTea Music Theatre’s production of La Tragédie de Carmen will be presented September 6-8 at Buddies in Bad Times Theatre. Click image for information. This entry was posted in Interviews and tagged Alaina Viau, Cassandra Warner, Georges Bizet, Glenn Gould School, Gregory Finney, La Tragedie de Carmen, LooseTea Music Theatre, Ninette de Valois, Peter Brook, Royal Conservatory of Music, Ryan Harper. Bookmark the permalink.